Herceptin - trastuzumab toegevoegd aan chemo (Doxorubicin en Cyclophosphamide en/of Paclitaxel) post operatief, geeft 10% meer overall overlevingen op 10 jaars meting en 37% minder risico om te overlijden binnen 10 jaar bij operabele borstkanker met Her2 positieve expressie. Dit blijkt uit de definitieve resultaten van de twee langjarige studies van de North Central Cancer Treatment Group NCCTG N9831 (Combination Chemotherapy With or Without Trastuzumab in Treating Women With HER2-Overexpressing Breast Cancer) and the National Surgical Adjuvant Breast and Bowel Project NSABP B-31 (Doxorubicin and Cyclophosphamide Plus Paclitaxel With or Without Trastuzumab in Treating Women With Node-Positive Breast Cancer That Overexpresses HER2). De overall overleving op 10 jaar meting steeg van 75,2% naar 84%. Median time on study was 8.4 years. Adding trastuzumab to chemotherapy led to a 37% relative improvement in OS (hazard ratio , 0.63; 95% CI, 0.54 to 0.73; P < .001) and an increase in 10-year OS rate from 75.2% to 84%. These results were accompanied by an improvement in DFS of 40% (HR, 0.60; 95% CI, 0.53 to 0.68; P < .001) and increase in 10-year DFS rate from 62.2% to 73.7%. All patient subgroups benefited from addition of this targeted anti-HER2 agent. Deze studies lopen al vele vele jaren en inmiddels zijn al weer nieuwere medicijnen (zie in gerelateerde artikelen of zoek op T-DM1 - Trastuzumab Entransine of lapatinib of zoek op personalised medicine in zoekmachine rechtsboven) naast herceptin ontwikkeld en goedgekeurd voor gebruik. Maar is natuurljk een prachtig resultaat. Ik wil er ook nog bij opmerken dat verschillende studies hebben aangetoond dat mede door de behandelingen met chemo een Her2 status kan veranderen van Her2 positief in Her2 negatief of omgekeerd. Ook blijkt soms dat uitzaaiingen in andere organen een ander karakter, een andere expressie hebben dan van de primaire borsttumor. Het volledige studierapport: Trastuzumab Plus Adjuvant Chemotherapy for Human Epidermal Growth Factor Receptor 2–Positive Breast Cancer: Planned Joint Analysis of Overall Survival From NSABP B-31 and NCCTG N9831 is tegen betaling in te zien. Adding trastuzumab (Herceptin) to adjuvant chemotherapy improved disease-free survival and overall survival in women with early-stage HER2-positive breast cancer. In total, 4,046 patients with HER2-positive operable breast cancer were randomly assigned to receive doxorubicin and cyclophosphamide followed by paclitaxel with or without trastuzumab in both trials combined. Stratification factors consisted of study, intended paclitaxel schedule (once every 3 weeks vs once per week), number of positive nodes (0–4, 4–9, ≥ 10), estrogen receptor and progesterone receptor status, and other patient and disease characteristics. In an initial joint analysis after a median follow-up of 2 years, trastuzumab treatment was associated with a 52% reduction in disease-free survival events (P < .001) and a trend toward improved overall survival (P = .015). A second analysis at a median follow-up of 3.9 years showed that trastuzumab treatment continued to be associated with improved disease-free survival (hazard ratio = 0.52, 95% confidence interval = 0.45–0.60) and improved overall survival (HR = 0.61, 95% CI = 0.50–0.75). The current definitive overall survival analysis was scheduled to occur when a total of 710 deaths had occurred. Median time on study was 8.4 years. Ten-year overall survival was 84% in the trastuzumab group vs 75.2% in the control group, with a hazard ratio (HR) for death of 0.63 (P < .001). On analysis adjusting for stratification factors and age, tumor size, and extent of surgery, the adjusted HR was 0.61 (P < .001). Ten-year disease-free survival was 73.7% vs 62.2% (HR = 0.60, P < .001; adjusted HR = 0.58, P < .001). Similar significant overall survival benefit of trastuzumab treatment was observed in patients with estrogen receptor– and progesterone receptor–negative disease (10-year overall survival = 81.6% vs 73.0%, HR = 0.65, 95% CI = 0.53–0.80) and in those with estrogen receptor– and progesterone receptor–positive disease (10-year overall survival = 86.0% vs 77.1%, HR = 0.61, 95% CI = 0.49–0.76). Disease-free survival benefit was also similar in patients with estrogen receptor– and progesterone receptor–negative disease (10-year disease-free survival = 70.9% vs 58.6%, HR = 0.62, 95% CI = 0.52–0.73) and those with estrogen receptor– and progesterone receptor–positive disease (10-year disease-free survival = 76.1% vs 65.1%, HR = 0.61, 95% CI = 0.51–0.72). Subgroup analyses also showed similar overall survival benefit of trastuzumab treatment according to age < 40 years (HR = 0.67, 95% CI = 0.46–0.99), 40 to 49 years (HR = 0.65, 95% CI = 0.49–0.86), 50 to 59 years (HR = 0.68, 95% CI = 0.52–0.90), and ≥ 60 years (HR = 0.51, 95% CI = 0.37–0.69) and according to tumor size 0.1 to 2 cm (HR = 0.51, 95% CI = 0.38–0.69), 2.1 to 5 cm (HR = 0.68, 95% CI = 0.56–0.82), and > 5 cm (HR = 0.58, 95% CI = 0.39–0.88). Significant disease-free survival benefits were also observed with trastuzumab treatment in all age categories (HRs = 0.50–0.64) and tumor size categories (HRs = 0.47–0.65). According to nodal involvement, 10-year overall survival rates for the trastuzumab vs control groups were 89.0% vs 83.1% for 0 to 3 positive nodes, 79.2% vs 70.4% for 4 to 9 positive nodes, and 71.7% vs 52.6% for ≥ 10 positive nodes. Edith A. Perez, MD, of the Mayo Clinic, Jacksonville, is the corresponding author for the Journal of Clinical Oncology article. The study was supported by grants from the National Institutes of Health, NSABP, and Cancer Leukemia Group B and by Genentech. For full disclosures of the study authors, visit jco.ascopubs.org. Edith A. Perez, Gerardo Colon-Otero, the Mayo Clinic, Jacksonville; Eleftherios Mamounas, University of Florida Health Cancer Center-Orlando Health, Orlando, FL; Edward H. Romond, University of Kentucky, Lexington, KY; Vera J. Suman, Mayo Clinic, Rochester, MN; Jong-Hyeon Jeong, Priya Rastogi, University of Pittsburgh; Nancy E. Davidson, University of Pittsburgh Cancer Institute; Norman Wolmark, Allegheny General Hospital, Pittsburgh, PA; George Sledge, Stanford University School of Medicine, Stanford; Silvana Martino, The Angeles Clinic and Research Institute, Santa Monica, CA; Charles E. Geyer Jr, Virginia Commonwealth University Massey Cancer Center, Richmond, VA; Julie Gralow, University of Washington/Seattle Cancer Care Alliance, Seattle, WA; Sandra M. Swain, MedStar Washington Hospital Center, Washington, DC; Eric P. Winer, Dana-Farber Cancer Institute, Boston, MA; Jo Anne Zujewski, National Institutes of Health, Rockville, MD. Corresponding author: Edith A. Perez, MD, Mayo Clinic, 4500 San Pablo Rd, Jacksonville, FL 32224; e-mail: perez.edith@mayo.edu. 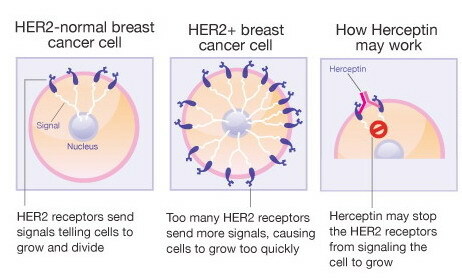 Purpose Positive interim analysis findings from four large adjuvant trials evaluating trastuzumab in patients with early-stage human epidermal growth factor receptor 2 (HER2) –positive breast cancer were first reported in 2005. One of these reports, the joint analysis of North Central Cancer Treatment Group NCCTG N9831 (Combination Chemotherapy With or Without Trastuzumab in Treating Women With HER2-Overexpressing Breast Cancer) and the National Surgical Adjuvant Breast and Bowel Project NSABP B-31 (Doxorubicin and Cyclophosphamide Plus Paclitaxel With or Without Trastuzumab in Treating Women With Node-Positive Breast Cancer That Overexpresses HER2), was updated in 2011. We now report the planned definitive overall survival (OS) results from this joint analysis along with updates on the disease-free survival (DFS) end point. Methods In all, 4,046 patients with HER2-positive operable breast cancer were enrolled to receive doxorubicin and cyclophosphamide followed by paclitaxel with or without trastuzumab in both trials. The required number of events for the definitive statistical analysis for OS (710 events) was reached in September 2012. Updated analyses of overall DFS and related subgroups were also performed. Results Median time on study was 8.4 years. Adding trastuzumab to chemotherapy led to a 37% relative improvement in OS (hazard ratio , 0.63; 95% CI, 0.54 to 0.73; P < .001) and an increase in 10-year OS rate from 75.2% to 84%. These results were accompanied by an improvement in DFS of 40% (HR, 0.60; 95% CI, 0.53 to 0.68; P < .001) and increase in 10-year DFS rate from 62.2% to 73.7%. All patient subgroups benefited from addition of this targeted anti-HER2 agent. Conclusion The addition of trastuzumab to paclitaxel after doxorubicin and cyclophosphamide in early-stage HER2-positive breast cancer results in a substantial and durable improvement in survival as a result of a sustained marked reduction in cancer recurrence. Reageer op "Herceptin - trastuzumab naast chemo geeft 37 procent minder kans op overlijden en 10 procent meer overlevingen op 10 jaar bij Her2 positieve borstkanker."